Hanging data binder features Presstex covers and storage hooks to secure up to 6" of unburst sheets. Design is top-loading and bottom-loading. Acrylic coating on binder provides a water-resistant cover. Retractable filing hooks are designed for both single-point filing and drop file system. These flexible nylon posts adjust to hold up to 6" of sheets attached in continuous form. 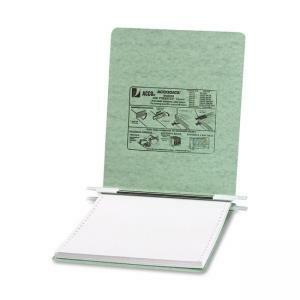 Binder contains 50 percent recycled material with 10 percent post-consumer material. Sheet Size: 9.50" x 11"